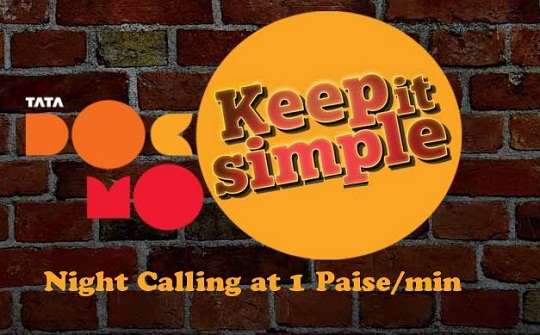 Now that the tariff war between telecom companies is almost steadying up, Tata Docomo has launched a pack which offers local night calling to any Tata number(excluding fixed line cdma) for as low as 1 paise/min with a special recharge of Rs. 41 valid for 30 days. The benefits of this pack can be availed from 11 pm to 7 am. Normal tariff of 1 paise/sec will apply for all Tata calls during the day. Fair usage policy of 1000 minutes is applicable to night calls made to any Tata number beyond which the calls will be charged as per base tariff of 1 paise/sec. Base calling rate applicable after first 1000 minutes. This pack is quite good for all the night lovers around but it doesn’t compete well with the On-net packs of Uninor. Uninor is already offering 1,20,000 seconds(2000 minutes) on RC 38 and 2 paise/min local Uninor calling on RC 22 so would you still opt for the “night calling pack” of Tata Docomo when Uninor is offering such dirt cheap tariff for “whole day”?? Only benefit is the option to call any Tata number as opposed to a comparatively smaller customer base of Uninor.